‘Positive’ responses: You can now label certain questions and certain responses to be flagged as ‘positive’ – for example to easily know who is coming to the school dance. You can then take actions based on these responses. 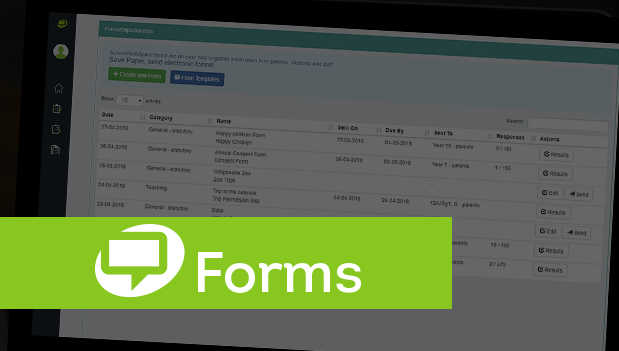 Archive Forms: We have added the facility to individually archive old forms that are now complete, to tidy up the page of open/ongoing forms. You can also do this en-mass by selecting a date, and archiving all forms older than this date. Attachments: You can now add more than one attachment to a form – handy when you have many documents to send about a trip or event! Response Analysis charts: There is a new response analysis charts feature, under a form’s results, to view charts on response times and types. Printing: Improvements to printing responses, such as printing in alphabetical order and printing individual, selected or all responses. Other general improvements, tweaks and bug fixes.